*Free mid-size car while cars are available. Not valid with any other special offers. Car can be upgraded for minimal fee, unlimited mileage and taxes included, and is picked-up and dropped-off at the airport. Don’t settle for a cramped hotel room with a view of the parking lot when you can live it up in a airy condo with a million-dollar view. Poipu Shores 304A invites your ohana – family – to experience the best of Hawaii! Sunsets don’t get much better than what you’ll get from lounge chairs on the private lanai. Thanks to the third-floor location, the views are even more spectacular! Don't worry about the steps; the building has a convenient elevator to get you and all your belongings to the third floor. Tropical touches in the living room put you in full vacation mode. When you’re ready for some downtime, curl up on the couch or love seat and flip through the channels on the 32” TV with DVD player. The pretty tile flooring flows into the dining area and kitchen, where you’ll find more high-end touches like granite counters, tile backsplash and handsome wood-grain cabinets. Cooking is a cinch too, thanks to a practical layout, full-size appliances and starter kit of Kauai Company Coffee and condiments. Wake up to the blue waters of the Pacific in the master bedroom with king bed and en-suite bathroom with granite counters and tile shower and tub. The 2nd bedroom sleeps two more in a queen bed and the living room sofa is also a queen sofa sleeper with new mattress. The 2nd full bath has a granite vanity and walk-in, tiled shower with a side-by-side washer and dryer next door. 1. Flexible, Roomy Floor Plan: No need to bring the air mattress! With two nice-sized bedrooms with a king and a queen bed, plus a pull-out queen sleeper sofa, there’s plenty of comfortable sleeping space for your family. 2. Million-Dollar Views: Thanks to its third-floor location, the condo offers spectacular oceanfront views from the lanai, as well as inside. Watch the dolphins and sea turtles play in the blue waters year-round and the humpback whales travel through the area in the winter. 3. Gorgeous Pool and Grounds: Spend the afternoon worshipping the sun out at the sparkling pool. At the end of the day, watch the sunset from the pool area. Many guests love to gather in the grassy area next to the pool for an even better view. A/C in the living area and master bedroom. 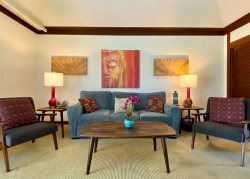 Guest review taken from Airbnb on 4/4/19 for Poipu Shores 304A --- Outstanding! We stayed here last week for 6 nights and are already dying to go back. The unit was clean, with a well-equipped kitchen and very comfortable beds (great mattresses, soft sheets, lots of pillows). The ocean views from the unit and the swimming pool were truly breathtaking. From the pool deck, we saw sea turtles swimming in the waves EVERY day. Several times, we saw whales off the coast and were even lucky enough to see one breach! Simply wonderful. We were very happy to have the new A/C running in the condo as this trip was very warm. A great addition to an already wonderful property. GVR staff took great care of us and their hospitality made our vacation even more wonder. Great place and great people. Property Manager's response: Thank you for your wonderful comments. Glad you enjoyed yourselves. Come back and visit someday! The great vacation staff is wonderful. Every direction and help is very detailed. Ideas about what to do on vacation linked i n their welcome letter is really helpful. I love this property. The location, the space, decor all excellent. I love the linai. The views are spectacular and the sound of the waves right outside? Amazing. The beach at Brenneckes is a short walk. Sunsets are easily viewed off the linai as well. I hear air conditioning is being installed at this location soon. We love the breeze and air flow of this space and didnt feel like we needed it. But understand other times a year it may be needed. This property is where we will always return to on our stay. The management team is wonderful, friendly and there when you need them. Mahalo! MANAGER'S RESPONSE: Wow, now that is why we love having your return. Thanks! Views, views, views!!!! This place had the most gorgeous views from the balcony, bedroom window, and pool. Great little condo. They were kind enough to give me a balloon and cupcakes for my birthday which was the day of check in. I highly recommend this place.. just know theres no AC and you have to be alright with that! Thanks guys! We loved it. Awesome stay, great location and helpful staff!! Beautiful condo on the shoreline. And lots of amenities in the condo. We would stay here again! I would say that the only thing missing was a beech cooler. When your in Hawaii with small kids you have to have a cooler for drinks, sandwiches, snacks etc..I know your able to rent them but to be honest as nice as the condo was I was surprised to not have a cooler in the room. We stay often in Kauai and the other resorts have coolers in the closets and its very nice to have. 304 A was a great condo and everything was stocked up nice. Appreciated the newer utensils and the attention to detail. I also liked having the soap, shampoo and conditioner supplied, very nice touch. We absolutely Loved staying in 304 A and will be back again. Our stay was rather last minute (2 days notice). Bruce was amazing. When the first condo we were looking at through HomeAway was not available, he emailed us two other properties that were available. I was able to speak to Bruce on the phone prior to arrival about late checkout and the car rental included. He was friendly and helpful. We never would have found this condo without his help! This condo was amazing, especially for the price! The oceanview, closeness to the beach, enough room for out family of 4 and having laundry in the unit sealed the deal. The parking was a little tight here, but we were always able to find a spot. Bruce was awesome! Extremely helpful and knowledgeable! Room was beyond our expectation! Very well stocked and clean. Very helpful. A smooth vacation in all respects. It is just like spending a few days in paradise. Outstanding service, and very organized process with excellent check in information. Help with a not properly functioning TV was prompt and resolved the issue. Would without a doubt use this company again. Property was a little dated, but still very comfortable. Waves crashing into shore were a great show. You really have a feel that you are at the ocean. Parking is very tight especially for larger vehicles. We were slow in looking/finding accommodations. We by chance called on one of your properties (which was not available) and Lynn Hufschmid, went to work and found us a beautiful place! Nice to find a hand written card welcoming us along with treats. Beach front properties that were beautiful and great! We have used aloha GVR in the past and again this trip and they are great! View! View! ViewQ The crashing of the surf against the rocks right off the front was hypnotic and of course seeing the turtles in the surf was a bonus. Hard to leave the deck to see what the rest of Kauai has to offer. The unit was nicely remodeled and clean with all the kitchen items needed even a rice cooker and bags to use at the Farmers Markets. Our bed was very comfortable but a little high for us short people. Needed to jump to get in. It gave us a laugh. The only thing that it lacked was air conditioning making it very difficult to sleep at night. All in all we really enjoyed ourselves and look forward to returning. Each person I had the opportunity to speak with was friendly, courteous and welcoming! I felt as though we were part of their family and were treated as such . Very helpful with great response times. Questions were answered very quickly.